Published on July 25, 2016 in architecture, general info and style. 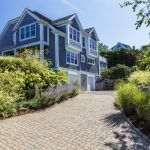 Closed Tags: Cape Cod, Cape Cod Luxury condo sales, Cape Cod new construction, Cape cod real estate sales, Provincetown condominiums, Provincetown luxury homes, Provincetown new construction, Provincetown real estate. MLS COPY: Privacy and luxury atop one of the highest peaks in town … this 3 bedroom, 3.5 bath home is but one of 8 homes in the exclusive Telegraph Hill Road neighborhood. This property has now been upgraded to the highest quality with renovated en suite bathrooms, beautiful stained Grade A oak floors, a custom kitchen with stainless counter tops and viking appliances. The second floor open design of kitchen, dining and living is perfect for entertaining, complete with French doors to a large deck, wood fireplace and sweeping views out to the dunes and the Pilgrim Monument. A lower driveway enters into a 2 car garage which includes ample storage and a fully equipped professional gym. Large, light and spacious bedrooms run from the grand foyer entrance. Certainly a very special West End home and just a short hop into town or the beach!